Balnaves invite you to a morning in conversation, poetry and Q&A with Gold Logie winner John Wood. Visit our Wine Room between 1:30pm – 4:30pm and you may be lucky enough to have a chat and talk wine with Gold Logie winner John Wood. We’ve put together a local guide on the best places to eat, drink, sleep and explore Coonawarra. Coonawarra wineries will dig out some treasures from their cellars to offer visitors a rare opportunity to taste and buy aged wine during the month of July. An opportunity to taste and purchase a 10 year old Chardonnay as well as the 2009 The Tally Reserve Cabernet Sauvignon available for the month of July. Visit us on the weekend and warm up with a glass of Mulled Wine! From the peaceful vineyards of Coonawarra, to the energetic hubs of Australian cities, the Coonawarra Wine Tasting Roadshow travels to six capital cities during the month of August. Meet the owners, winemakers, and vignerons from up to 30 wineries, and taste over 100 wines. A month of celebrations all in the name of the much loved variety of Cabernet Sauvignon. 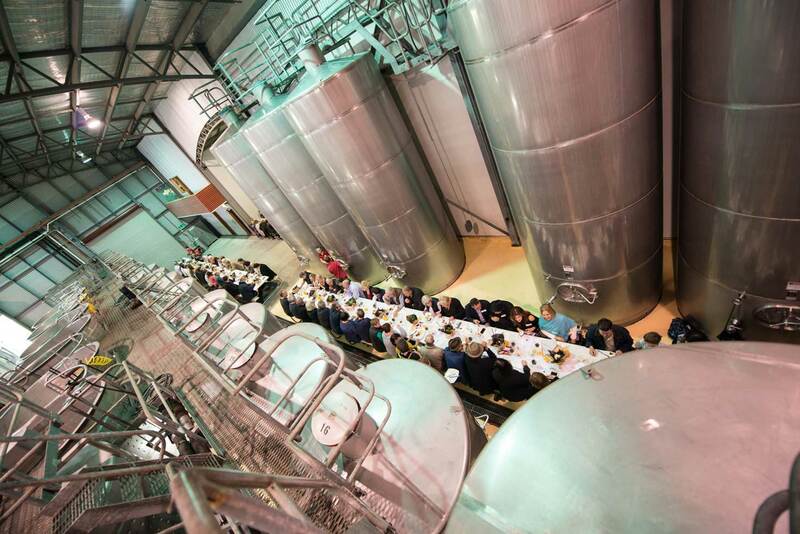 Celebrations include a wide range of dinners, breakfasts, lunches, tastings, The Coonawarra Masterclass & Retrospective Tasting just to name a few. Make the most of these opportunities to really savour the region’s wines, hospitality and sense of community. Details to come at a later date. Join us for a long weekend of fun & games on the lawn at Balnaves. We’re celebrating Cabernet Month with the release of our much-loved, all-round crowd pleaser, The Blend. Our ever popular annual Breakfast & Bubbles is on again as part of the Coonawarra Cabernet Celebrations this October. Join us for a day out of comedy, music, wine (from 12 Coonawarra wineries), food and good times. 2018 is set to be labelled an amazing Vintage. We are very pleased to be awarded 5 RED STARS from James Hallidays’ Wine Companion 2018 for the 17th consecutive year as well as all wines received 93 points or above! For the full tasting notes and results click here. The Balnaves & Redman families have come together to celebrate one of the unsung heroes of Australian wine with the release of the 2016 William Wilson Coonawarra Shiraz Cabernet. A unique blend of families and varieties, the limited edition $300 a bottle “traditional Coonawarra” style is the most expensive wine ever released in Coonawarra. We are very pleased to be awarded 5 RED STARS from James Hallidays’ Wine Companion 2018 for the 17th consecutive year as well as all wines received 94 points or above! For the full tasting notes and results click here. Big winter rains 890mm (instead of 566mm average) flushed the landscape and recharged the aquifers prior to budburst. This has been the wettest winter since 1989 according the S.E. drainage board, setting the vines up really well for summer. Overall the vintage is very solid with great colour, good fruit intensity and ripeness. The fruit was clean and hung well compensating for the compression of vintage. Whites came with good natural acidities this year and show a lot of freshness and tang, with fine fruit flavours. Vintage 2015 started with good rain falls in winter up until August, but subsequently we experienced dry conditions all through spring and early summer. A big dump of rain fell in January freshening up the vines after the long dry season, but this was the only significant rain of the growing season. Vintage 2014 started with good winter rains and a full recharge of the aquifers and complete soil flushing, setting the vines up for a good start to the season. However weather remained cool during the start of the season and was cold during flowerings, which lead to a reduced set and spread set. Pre-season saw reasonable winter rains and a cooler start to the year, with phenology on long term averages. Particularly cool nights were experienced leading up to fruit set. Very good winter rains set up an excellent start to the season, but poor weather during flowering and the hangover from 2011 poor weather during bud initiation affected set reducing yields down to 0.8-1.8t/acre particularly in Cabernet Sauvignon and Shiraz. Good winter rainfalls in winter 2010, followed on from good winter rains in 2009, recharging the aquifers. This became somewhat of too much of a good thing when rain continued in regular intervals through summer and into autumn 2011. Excellent winter rain in 2009 set the scene for a very good 2010 vintage. While the total amount of rain that fell was on long term average, it fell in solid blocks, filling the swamps in the region and percolating through into the underground aquifer. Winter rains were again well below average for the winter of 2008 leading up to vintage 2009. Crops were slightly below average and bud burst again very early 2-3 weeks ahead of average timing. 2007 was a very dry winter without normal winter rains preceded budburst. Spring brought a series of frosts (approx 35), with 4 very severe frost events during September, which burnt 70% of Coonawarra vineyard, leaving 20% untouched (which was under frost protection), and approximately 10% partially frosted. 2006 was very early with reds being harvested in March and in some cases wineries finishing vintage in March. Early year where baumes were quite high when tannins and flavours were eventually ripe. A lot of shrivelled fruit. However good flavours and tannin. Extremely late vintage where tannin ripeness was delayed, wines are middle weight but with good fruit and tannin structure similar to 1994 in many ways. Solid vintage. Early dry vintage with light crops due to poor set in 2002. Wines had a lot of water stress and ripened early due to light crops. Wines are solid but more earthy and complex flavours, rather than fruity. No Balnaves reds released. Poor set lowest yields on record combined with a very late year. Wines are unusual in structure. The Cabs retain some leafy notes, while Shiraz was stronger. No Tally made in 2002. Cool classic year crops were thinned to get balance but nice season and very good wines good depth of fruit and tannins. Strong year at the top end. Tally made. Very hot vintage, low yields due to poor set, super ripe flavours in wines and soft tannins. Drinking well early but appear to be developing well. Tally made. Excellent classic year similar to the 2001 but with stronger tannin structure. Deep fruited wines that are going well. While looking dark and closed should continue to age well. No Tally made. Hot year with big tannins and big baumes. Similar year to 1990, very ripe and very big wines with much riper flavour profile than usual for Coonawarra. Appearing to develop faster than 1997 or 1999. Cool year with late ripening and rain during harvest which caused some problems. Wines show typical cool vintage aromas of black olive and leaf but are aging well and look better with time. Cooler year again with rain during vintage causing earlier picking than desirable. Still wines are solid and aging well, drinking well now and probably won’t improve. Most difficult vintage of the 1990’s, with early break rain and disease pressure. Limited wines released but still holding on. Cool season later ripening but with good fruit, and tannins. Same cooler season flavours and fruit starting to fade in these wines now. Dry season but similar to 2003 Produced austere wines with early complex flavours and harder tannin structures, most are passed now. Limited wines made due to early break and rain during vintage. Most are passed their best. Great year strong wines, rich flavours and tannins. Now are mature wines from an excellent vintage and are complex and holding on. Try and drink up. Hot year with rich opulent wines still holding on and looking good as old wines. Time to drink these wines, now.